Finally the Tyrrhenian Navy was allowed the funds to build what it wanted, a 28 knot Battlecruiser with 8x14" and a 10" armoured belt. By the time the ship was completed in 1916 it was badly outclassed by the fast-battleship concept and the German and United States battlecruisers of the same time. Tyrrhenia's problem was that its building yards were slow in comparison to the other Dreadnought building nations. Even with the double shifts instituted on the outbreak of war it still took 4 1/2 years to build the Crete. What made it possible for the Tyrrhenian's to be able to build the Crete was the deal done with the Americans for four twin turrets of 14" of the make and model as ordered by Greece for the Salamis class ship being built for them in Germany. The design was an improved Sardinia with extra length for the fourth turret and extra breadth for the secondary weapons and machinery. The much bigger ship required a larger propulsion plant to keep the speed at the 28 knots required by the Tyrrhenian Admiralty. For the first time, anti-aircraft guns were put aboard a new ship. The 5.5" secondary guns were carried forward to the Crete but this time they were all mounted in light twin turrets. A lot of superstructure parts were copied over from the Sardinia which helped to speed up production and reduce costs. On completion, the Crete actually looked the part. Long low and mean with big teeth and an armoured heart. The Crete might not have been as good as the very latest ships but it was as good as any of those ships in its era, HMS Lion, SMS Derfflinger. During WW1 the Crete had some exciting times operating in the Adriatic Sea chasing the Austro-Hungarian Navy. Then in 1918 the Crete was guardship at Imbros when the Goeben/Yavuz came calling. The Crete fired its main guns at the Goeben/Yavuz while the Goeben/Yavuz fired into the packed shipping, sinking the monitor Abercrombie, which was one of the four monitors built with the main guns from the order for Salamis. Though the Crete raised steam and chased after the Goeben/Yavuz, the Turkish ship made it back into the safety of the Dardanelles before the Crete could catch up. When you start with a good platform, rebuilding it should only enhance the ship. So it proved with the Crete. The Sardinia had been revitalised in 1933-34 and it was not till 1937 that the Tyrrhenian Navy was able to make the funds available to rebuild the Crete. The ship was stripped from 'B' to 'X' turret. New machinery, deck armour, superstructure, and secondary/tertiary armaments were installed in the space provided. One thing arriving on the rebuilt ships of the Major Powers was Radar. It was not till 1941 that Tyrrhenian ships started receiving surface and air radar types of German manufacture that they were then able to make under license. The Crete came out of its rebuilding phase looking as good as any of the rebuilt ships. But what the eye could not see was that the Tyrrhenians had not upgraded the underwater protection. 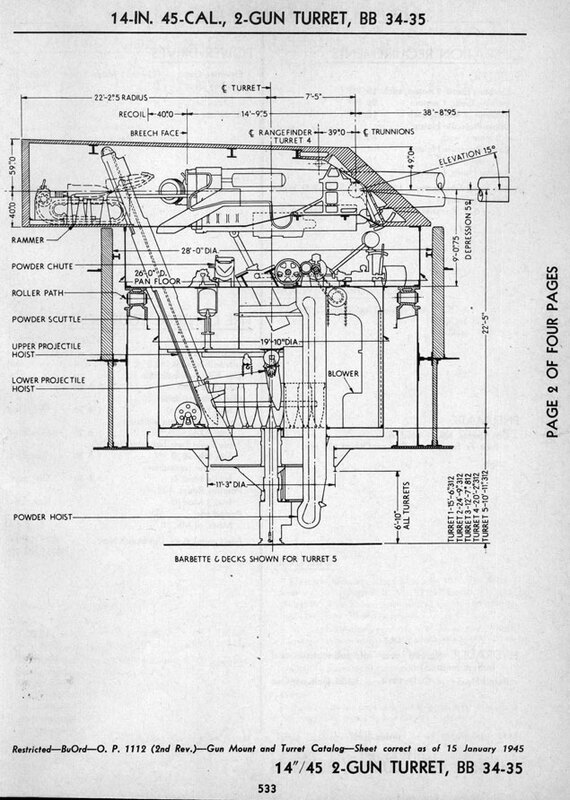 No bulges or new underwater system (like the Italians) was fitted, the money had run out for Crete. This proved the ships downfall in 1942, when one torpedo hit completely wrecked the engine room. The ship barely managed to make it back to port and the Crete was still under repair when Tyrrhenia Surrendered twelve months later. Repairs finally finished in 1944, the Crete joined the rest of the surrendered Fleet at Syracuse. 1945 and the Crete becomes the fleet Training and Gunnery Training ship. Lasting in that position till 1956 when it was deleted and scrapped. Same twin turret, of US origin, used on the Crete.